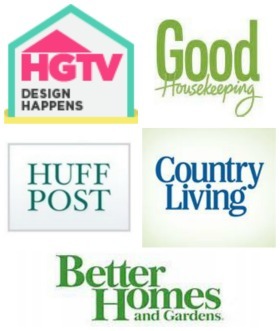 Are you up for a thrifty makeover today? Well I hope so because that’s exactly what I’m sharing! Immediately when I saw it, I imagined fabric in the panel on top. 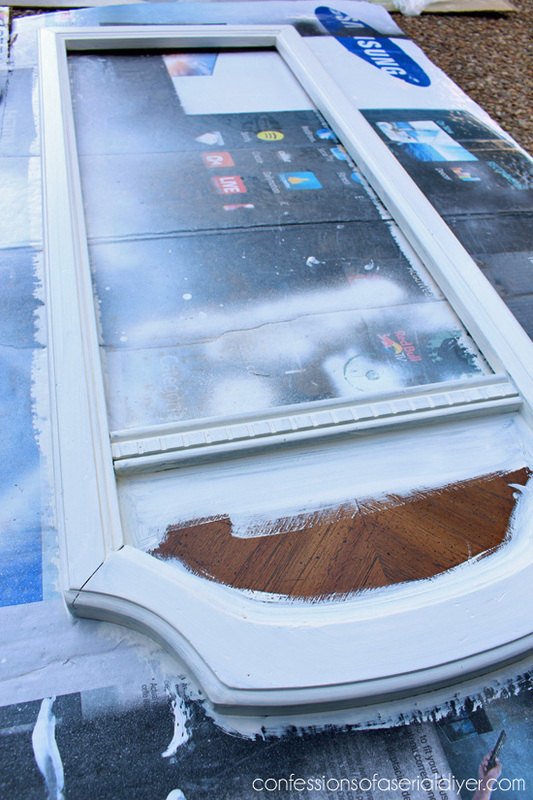 First I removed the mirror and painted the frame in DIY chalk paint in Cottage White by Behr. Bye bye ugly mirror! I gave it three coats, then sanded the edges a bit. Then I sealed it with Minwax paste wax. This was my first time using Minwax instead of Annie Sloan soft wax and I can’t yet tell how I like it. I’ll need to try it on a larger piece next time. The panel up top popped out so I just traced the outline onto my fabric. 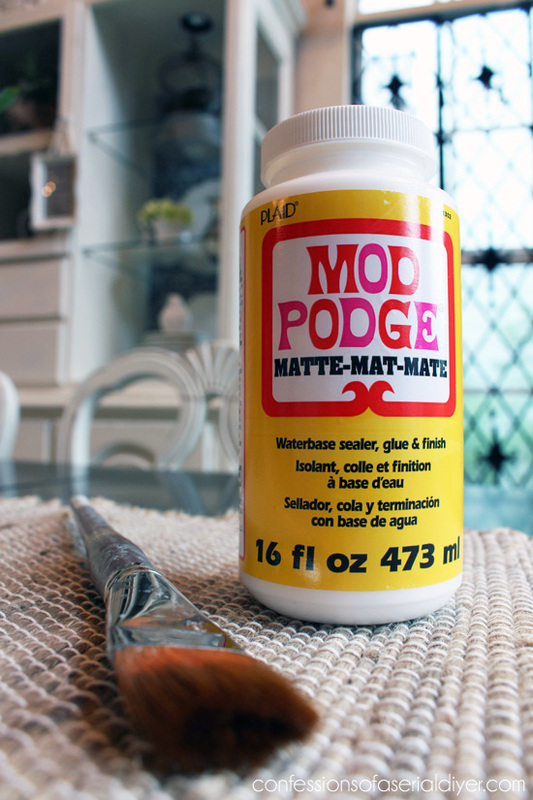 I used Mod Podge in the matte finish to adhere the fabric to the panel. I brushed it on the panel like glue, then laid the fabric over it and smoothed it out. 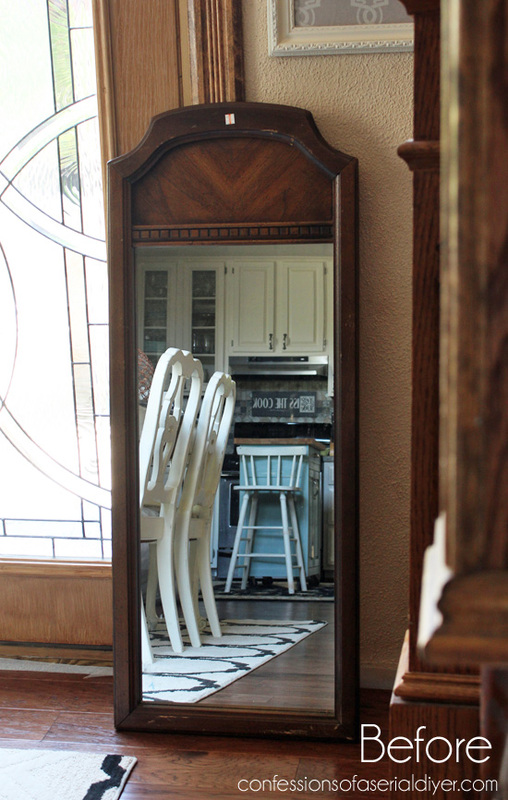 I hung the mirror above this table to take pictures and ended up leaving it here for my Summer Home Tour, but I’m not sure if it’s too matchy matchy? It lives on another wall though, I just borrowed it for the picture. And as much as I liked this pedestal table here, it stuck out just a bit more than I liked, so to the shop it went. I think I like it better. What do you think? This one was a lucky $2 yard sale find. I couldn’t pay the lady fast enough! I am really pleased with how my new mirror turned out though. It’s a long way from where it started! The French fabric adds instant sophistication. 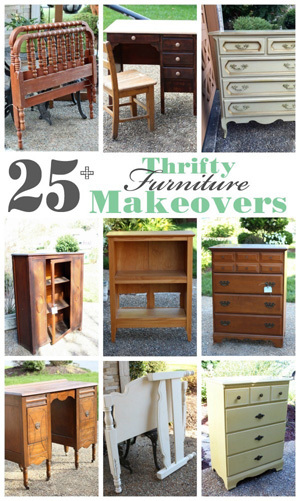 Hope you liked this thrifty redo! 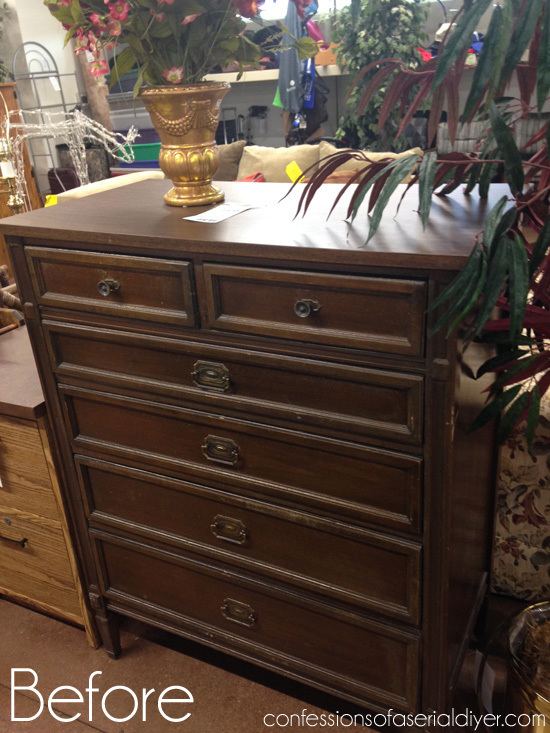 See how I brought this dated beauty back to life HERE! 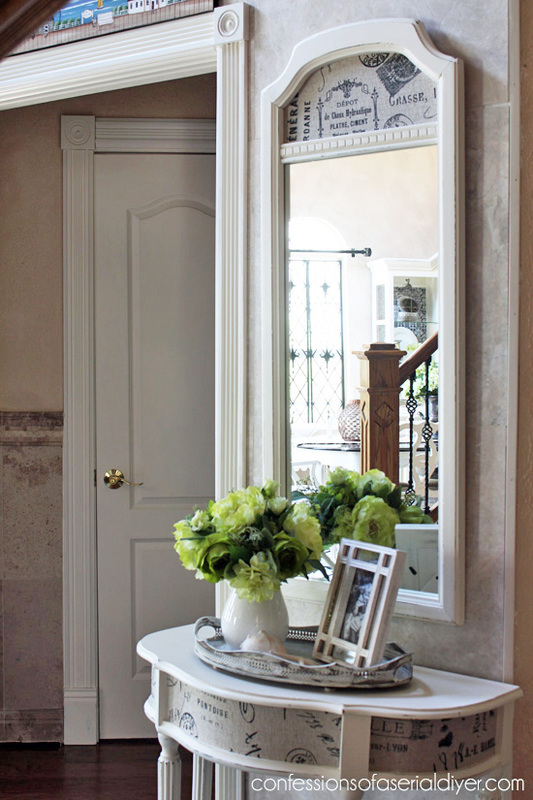 Christy, This mirror is such a winner! I love the fabric inlay and the Cottage White is perfect. 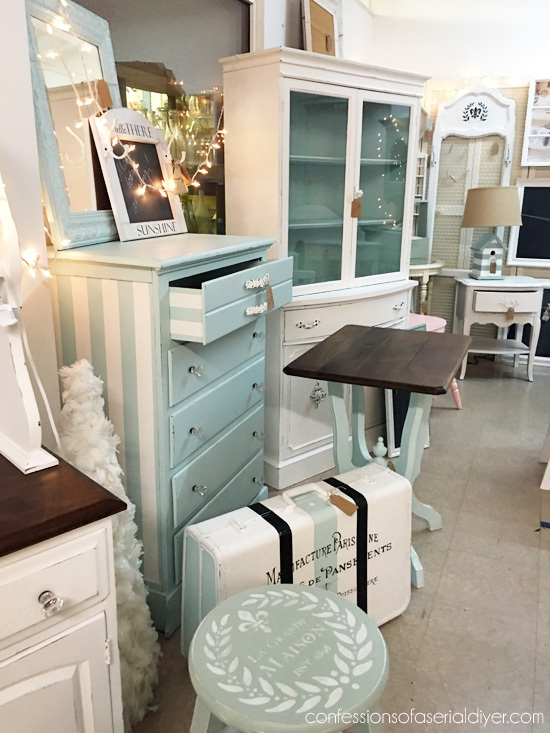 Love this makeover and it goes so well with the table makeover. Positively delicious! Thank you!!! What a Beautiful make over. Hard to believe that it was the same mirror. Thanks, Colleen! It really was so dark and dated before. Love the new mirror with the table but that is how I am. I am a very symmetrical person and like how the two pieces look together. My friend teases me all the time about this!!! I love the new mirror there!!! I don’t think it is too matchy either. I think they compliment each other. I would leave it there Christy!!! I have to agree with you about the mirror being too matchy matchy. I like the dark frame for the contrast. Great job on the redo. 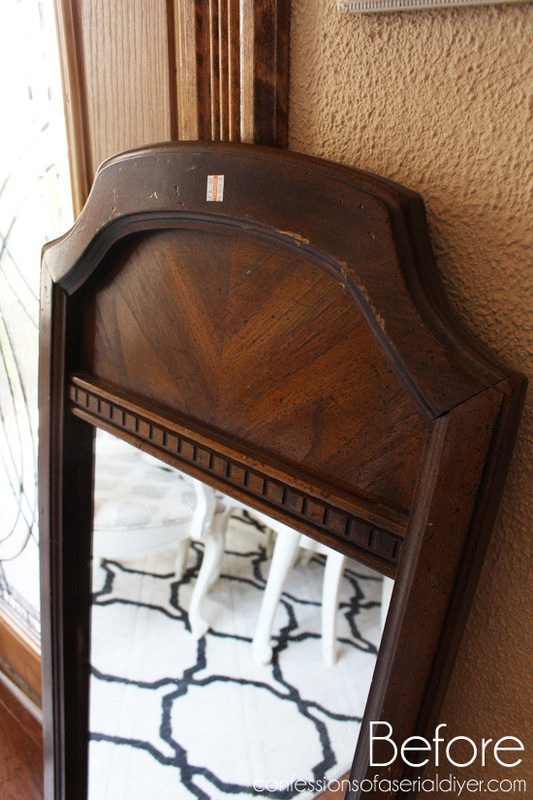 Great re-do of your mirror and the match-catchy look doesn’t bother me. Love that $2 yard sale find! I am not a matchy matchy girl at all!! lol But I ADORE that with your table. It’s perfect. I hope you keep it! 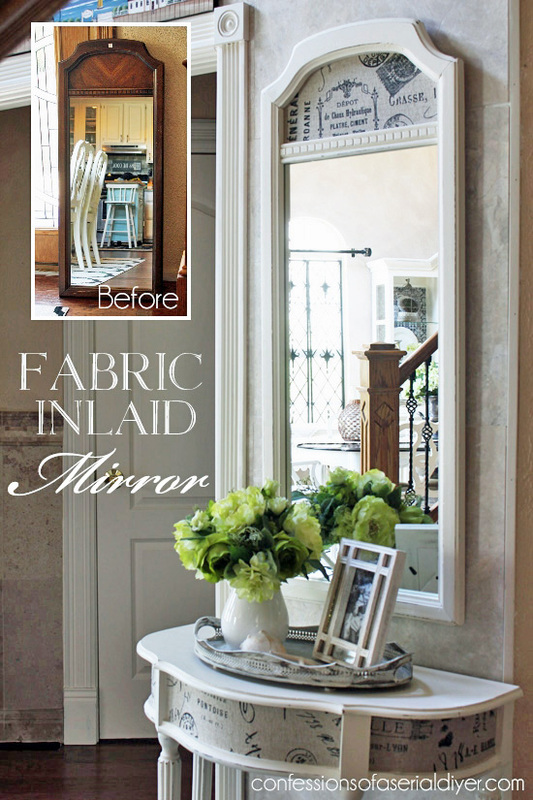 Love your mirror redo! Sometimes matchiness isn’t a bad thing–I like it with your demilune table. The size of it fits the space very well. Thanks for sharing another fabulous make-over! I so admire how you have the creative talent to breathe life into old tired pieces, and the vision to pick out such interesting pieces at yard sales/thrift stores to put your magic “spin” on! Terrific job with the fabric inlay mirror, and the table below as well!!! Love them both! I don’t mind the matchy matchy effect at all. But when I saw the pic with the lucky $2 mirror I did like the contrast in that combo better. 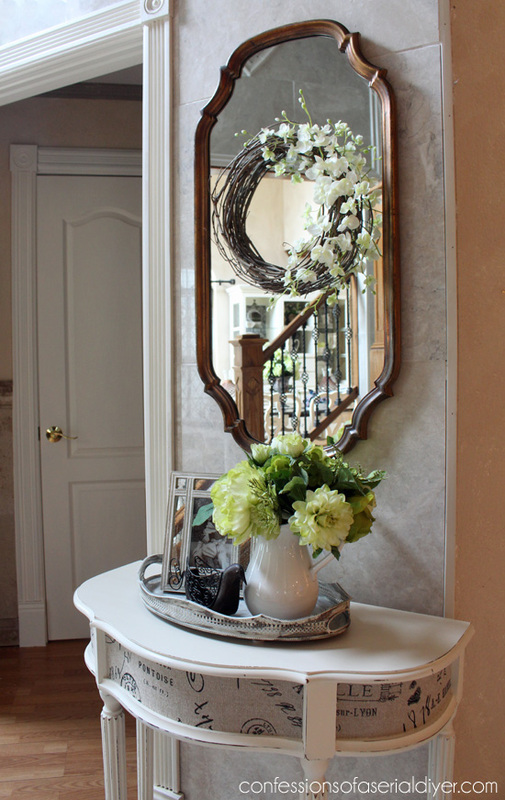 Seems to let each piece, the table and the mirror, “shine” as individual parts of the vignette – adding more interest. 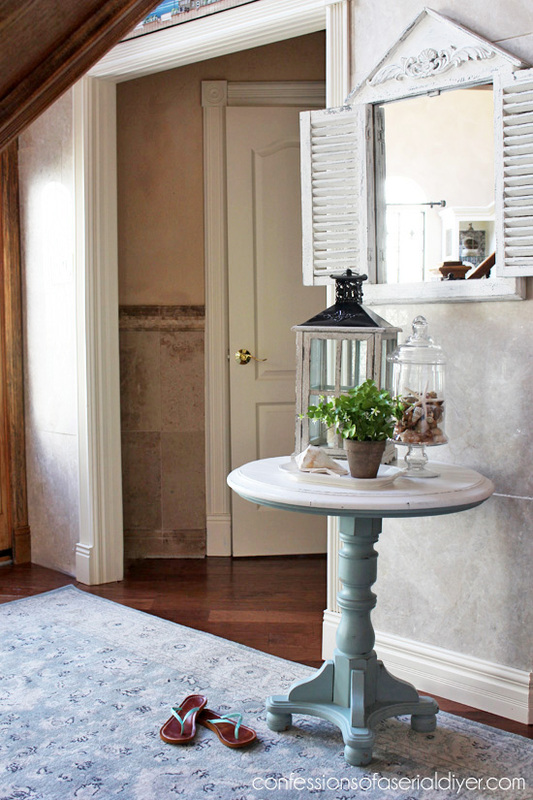 I still love the matching table and mirror together – but it appears as more of a “set”. Either way, in my opinion, you’ve got a win-win! I like the new mirror better in that spot. I didn’t even think matchey-matchey. I just thought, “perfect !! !….as usual”. Going back once more…..YES! the new mirror gets my vote!!! 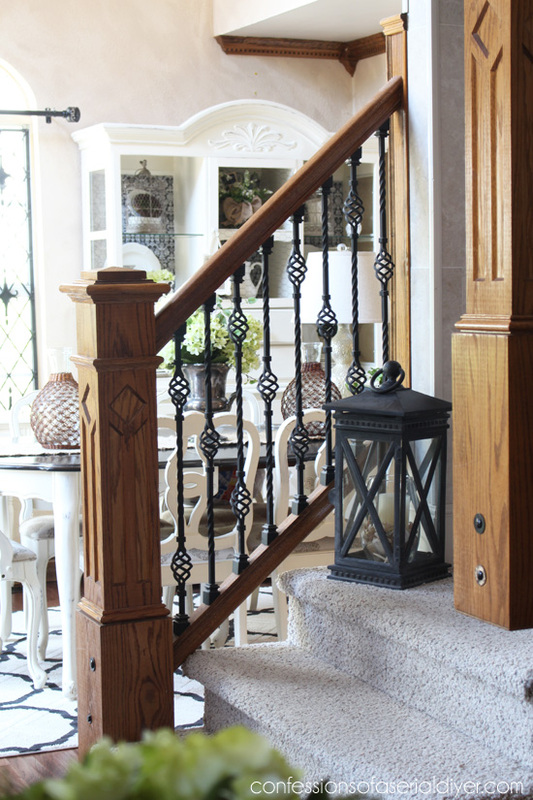 I guess I don’t like the other one being brown stain….of course, I guess it depends on how close it is to that staircase. Oh, one, one more thing, I think I like it right next to the matching table instead of having that feeling of, “now, where did I see that fabric in this room/house”. To me that is too match-matchy. I really love love love all your post! Thank you so much for sharing and giving us all the tips and tricks :). You inspired me with all your great ideas. 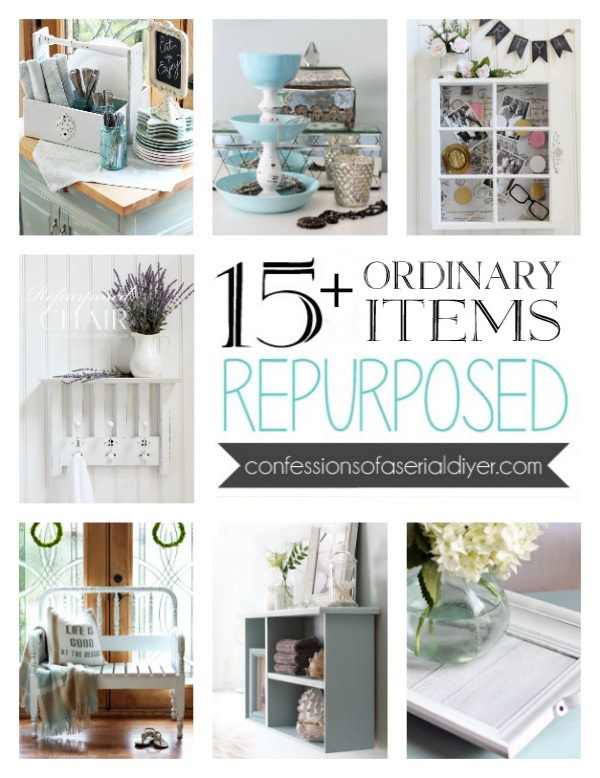 I started buying old furniture and update them. ( ill send you some pic with a before and after to see my progress 🙂 ) My biggest problem is that here in Romania you cant find all the products that you are using and i have to find a replacement for them or to make them my self. Chalk paint is impossible to find, so i made my one with Plaster of paris ( took me looooog time to figure out what is Plaster of Paris :)))) Now i’m trying to make my own dark wax coz i cant find one here. Maybe you can do a post on that. Thank you again for all that you are doing!!!! Looks beautiful Christy! Love both ways so I would keep it & change it every now & then. I think it’s genius that you keep a stash of the same fabric for things! I never even thought about it before but it sure saves decisions on what to use. Thanks again for some more inspiration! Christy I’m not one for matchy matchy but honestly I think the mirror looks great above your fabric inland table. Besides it’s just too darn pretty to let someone else buy…keep it girl! 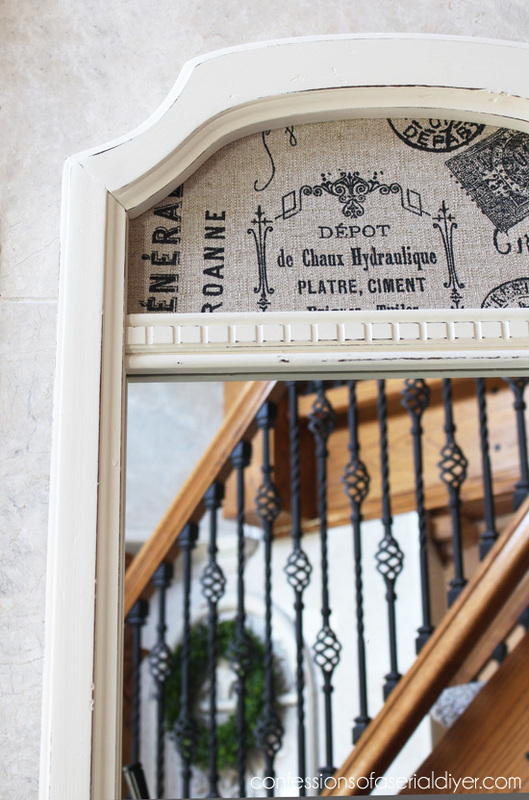 Well, once again, you’ve hit it out of the part with this gorgeous mirror!! Love it. I am very interested to hear your opinions about the Minwax. 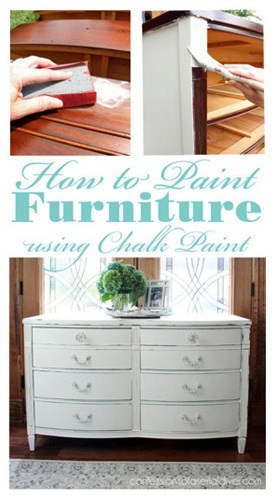 I’ve been reading reviews about using it over white chalk paint so I’m anxious to hear your take on it. It sure would be more affordable for me over the AS wax. Keep on creating!! !